Ray Harryhausen is one of the greatest and most influential figures in Hollywood’s history. It is thanks to his vision and his work that audiences today can enjoy classic movies such as 20 Million Miles To Earth, It Came From Beneath The Sea, Earth vs. The Flying Saucers, The Beast From 20,000 Fathoms, and so many other greats. He and his movies have been the influence for countless filmmakers and special effects experts over the years with his sequences and movies being rebooted in various ways. So it is no surprise that considering the massive footprint left by the cinematic “titan” that so many documentaries and books have been released over the years centered on him and his work. The problem with those documentaries and books there is very little variance in the material presented in each one from one to the next. Enter Arrow Films’ new Ray Harryhausen retrospective Ray Harryhausen: Special Effects Titan. This presentation is the best Harryhausen documentary to be released to date. That is due in part to it being such a deeply comprehensive presentation. This will be discussed shortly. The information and material that makes up the body of the program is just as important to the documentary if not more so. It will be discussed later. The bonus material that is included in the documentary’s Special Edition Blu-ray rounds out the documentary’s most important elements. It joins with the program’s story and information to make the presentation in whole one that is a must see for any true cinephile. 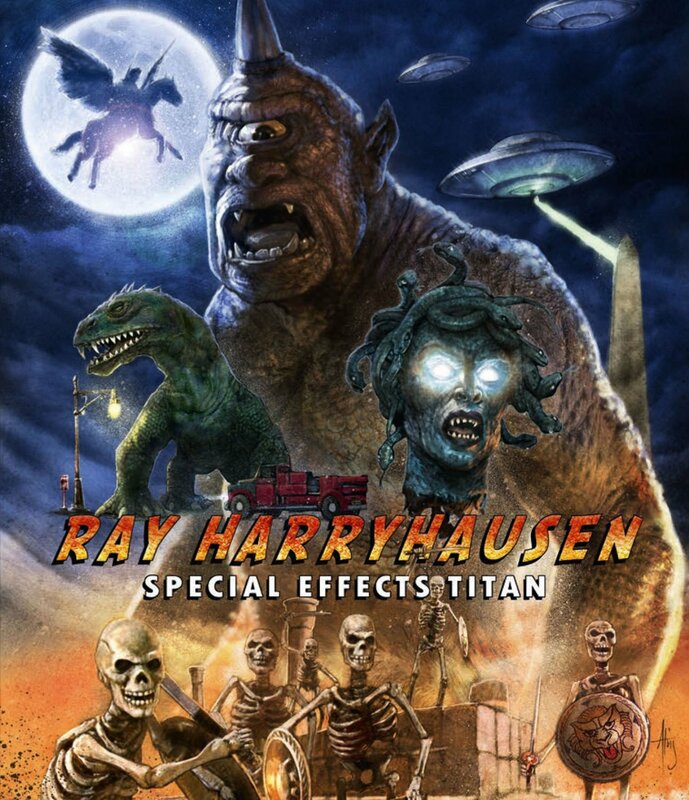 Arrow Films’ new Ray Haryhausen retrospective Ray Harryhausen: Special Effects Titan is a must see for any true cinephile. It is the best Harryhausen documentary to be released to date. That is due in part to its story. It is the most comprehensive look at Harryhausen’s life and impact that has yet been produced. Unlike so many other previously released Harryhausen docs, it focuses on more than just his major movies. Rather it follows Harryhausen’s life from his youth to his earliest work making stop motion fairy tale films all the way up to the height of his popularity and eventual retirement. Audiences (even those that are largely familiar with his work) might find themselves in awe at the “giant” (bad pun fully intended) footprint left by the film legend even today in taking in this program. That is due to the discussions on the standards that he created and his adaptation to the changing course of movies and its impact on his success as well as discussions on the reach of his influence on filmmakers across the film world and so much more. The discussions include some very candid one-on-one interviews with Harryhausen himself before his passing in 2013 as well as some of the most well-known filmmakers and special effects experts in the business today. Between those discussions and the focus on each of his feature films, the comprehensive nature of this doc proves it to be unquestionably the best presentation on the film legend to be released yet. Its comprehensive nature is just part of what makes it such a standout documentary. The information and material that makes up the body of the program is just as important to its presentation as its overall story. The story at the center of Arrow Films’ new Ray Harryhausen documentary is in itself an important part of the program’s presentation. That is because it is the most comprehensive look at the film legend’s life and career that has been released to date. It is not the program’s only important element, though. The information and material that makes up the body of the program is just as important to its presentation as its story if not more so. The information and material that is presented throughout the program is just as awe-inspiring as the story itself. One of the most interesting of the program’s revelations is that it is thanks to Harryhausens creature features—specifically The Beast From 20,000 Fathoms—that the dinosaurs in Jurassic Park move the way that they do. It is openly stated by many of the interviewees that before that movie was created no one knew how dinosaurs moved. And ever since then every dinosaur-centric movie that has been made has used Harryhausen’s work as a model for its own creations. On a related note, there is a subtle yet powerful statement made by Harryhausen himself that he never made “monsters.” Rather he made “creatures.” It is a statement that said he didn’t want to make scary, horror style movies. Rather he wanted to make movies with creations that the whole family could enjoy without fear of anyone having nightmares. It is a statement that cannot be ignored. On another related note, audiences will be just as intrigued to learn that Mr. Harryhausen was the one responsible for the term “dynamation.” He used that term as Hollywood was transitioning from black and white movies to color films. He reveals in his interview that many people were beginning to use the term “animation/animated” to describe his movies. He notes that this gave an incorrect perception of his movies, so he came up with the term “dynamation” in order to maintain the perception that his movies weren’t just children’s movies. He wanted them to be taken more seriously. This is just some of the program’s key information. There are also some very interesting revelations about the influence of not only his movies but the sequences that were used in his movies, too. The information that is revealed in the program’s interviews is enlightening to say the very least. It is just some of the program’s most important information and material. As the program progresses audiences will be just as interested to learn of the influence of the very sequences used in Harryhausen’s movies on so many more modern movies. It is One of the most notable of the presented sequences is that of the creature in The Beast From 20,000 Fathoms eating its victims. The motions are directly mirrored in a similar scene from Jurassic Park in which the T-Rex knocks over a bathroom and eats the man inside. On another note, audiences will be just as interested to see the influence of the sword fight scene between Sinbad and Kali in The Golden Voyage of Sinbad and that of Obi Wan Kenobi and one of the key light saber battles in Star Wars: Episode II. Here are two totally different movies from two wholly different eras yet even with such a span of time and genres Harryhausen’s influence is felt just as strongly even there. It is just one more of so many examples of the far-reaching influence of Harryhausen’s sequences presented throughout the program. There are so many other examples presented over the course of the program. They collectively show why the material that is presented within the program’s story is just as important to the story’s presentation as its information. Both elements join with the program’s story to make the documentary in whole an even more interesting program. Even as interesting as the story and its content make this program, they are not its only key elements. The bonus material that is included in the documentary’s special edition Blu-ray is just as important to its presentation as its story and related content. The story at the center of Arrow Films’ new Ray Harryhausen documentary and its content are both important pieces of the program’s presentation. The story itself is the most far-reaching retrospective on the film legend that has been released to date. The information and material that makes up the body of the program adds even more interest and enjoyment to the program. That is because the collective mass includes some very insightful one-on-one interviews with Harryhausen as well as some equally insightful interviews with those who he influenced to work in the movie industry. As much as the story and its content do for this documentary they are not its only key elements. The bonus material included in its new home release is just as important to its presentation as those noted elements. There is a feature-length audio commentary from those behind the program’s lens that offers even more insight for viewers as well as a number of outtakes that didn’t make the film’s final cut, and a pair of Q&A session with some of the interviewees just to name a few items. One of the most notable mentions made in the bonus commentary is that of the reason for the program’s opening sequence. It is noted that in opening with recent movie titles, younger audiences will hopefully see that those movies were influenced directly by Harryhausen’s movies. It is a way to connect those younger viewers to the foundations of their favorite flicks. The outtakes are each preceded with their own slates explaining in no uncertain terms why each was cut from the final product. This in turn leaves no question as to the intentions of each outtake. It also creates its own share of discussion among viewers as to whether or not they personally feel that the outtakes should have been outtakes. It is another wonderful way to keep viewers entertained and engaged in the program’s overall presentation. The live Q&A sessions with the interviewees are just as entertaining because of their light-hearted nature. There are plenty of laughs to be shared even through the conversations and questions. The questions and conversations include which of Harryhausen’s creations is his favorite, how did the filmmakers get the footage for the documentary (which is in itself rather eye-opening) and Harryhausen’s own thoughts on his legacy among so much more. Between the two sessions audiences will find themselves just as engrossed in them as those that were there in attendance. This is just scraping the top of the proverbial iceberg. The “Treasure Trove” feature is simple. But it is one of the most powerful of the bonuses included with the program. It follows curators of the Harryhausen exhibit in London as they un-crate the models that the legendary filmmaker used in creating his movies. Those models include the UFOs from Earth Vs. The Flying Saucers, the Pegasus from Clash of the Titans, the Brontosaurus from Evolution, and so many others. The reverence shown for the models as they are removed from their crates is so moving. It shows the understanding and respect that those removing them have for what Harryhausen created. It shows an understanding and respect for the amount of time spent making them, too. In essence that respect and understanding shows that there is still a very real respect for Harryhuasen’s work in general and the influence that he still has today. It is just one more of the in-depth bonuses included in the program that makes the program’s presentation so enjoyable. 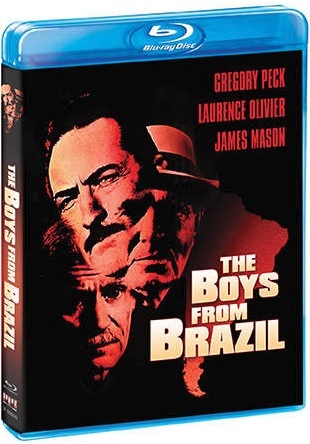 Together with those other noted bonuses, the program’s story and its content, all three elements come together to make it a must see for any true cinephile.